Is it Time to Dump Patronyms? I wear my surname much like I wear my nose. Not so much with pride but as an accepted fact of life and, therefore, with a certain degree of dignity. I had an opportunity to permanently change the name through adoption, but instead decided to honor my birth certificate (and never to have my nose fixed). Mind you, it was a personal choice. I make no judgment on what others chose. My sister, after all, opted for the change — and she had good reason: Our step-father, Louis Gordon, despite his many faults, was a spectacular human being. It wasn't until I began to pursue genetic genealogy — with an emphasis on the Y chromosome — that I started to regard my surname as having any substantial personal significance. The problem was that it's somewhat difficult to pronounce the "oo" without it sounding a little too ooey. I even changed my preferred first name from Mike to Michael because the back-to-front K sound is hard to enunciate. But more importantly, I had a harsh father, a trait, I happen to know, extended at least three generations. These facts made it difficult to develop a significant familial attachment to the name. Families of Anglo-Norman descent (and others) have been, in the last several hundred years, arbitrarily assigned the name of the father. It's merely a cultural artifact that has become a significant triumph for the patriarchy. Starting in the 16th century, the Spanish adopted the copulative conjunction, giving the child the name of both parents. (Pablo Picasso was born Pablo Ruiz y Picasso. Picasso was his mother's name.) East Slavic names mix it up to a much lesser degree. For example, Nikita Khrushchev's daughter was Elena Khrushcheva, a feminized version of the patronym. I had briefly considered using a hyphenated name, Cooley-Gordon. ("The English often do that," my mother told me.) Indeed, in our present culture, that's about as it good it gets in trying to acknowledge mixed heritage through family names. But there's a stark difference between using a surname to label a family and utilizing it to study and affirm a patrilineage by means of the Y chromosome, which often corresponds to the surname — but only so far. I might not be hot on Cooley as a family name, but it's provided great advantage for the genetic study of my male lineage, and it will help me one day "cross the pond." As a genetic genealogist, I favor the Y chromosome for several reasons. It doesn't go through recombination, that process by which the parents' autosomes (chromosomes 1 through 22) recombine to provide the child a randomized half of each genome. It passes only from father to son as a virtual clone. 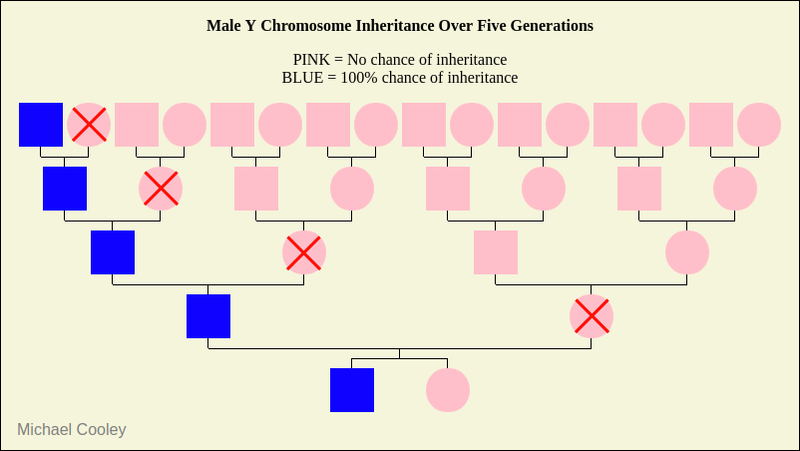 There are few coding regions (genes) on the Y, the principle exception being the male SRY gene, which is the reason only men have the chromosome. It occasionally mutates, on average one genetic letter per every 144 years. This means that, even after the rare mutation, it continues to pass as a slightly altered clone, branching into new subclades at fairly regular intervals, which are traceable through DNA testing. By cultural convention, the surname tends to be passed in the same way. It's patronymic and part of the larger culture of patrimony. These factors give the Y chromosome a research advantage. Yes, mitochondrial DNA passes similarly (if for different reasons), but several thousand years can pass before even one mutation occurs. Therefore, it branches into subclades far outside the historical — and, particularly, the genealogical — timeframe. And the maternal surname (i.e, maiden name) changes every generation, making it difficult to trace, especially considering that a woman's name was infrequently recorded in past eras. Although my Y chromosome can be tracked through at least nine generations, and although it's convenient to label it "the Cooley Y," other surnames have emerged out of the same branch — Hackett, Whitfield, Brock, Schindler, and more. Moreover, there is no single "Cooley Y." The Cooley DNA Project has found a dozen and more separate and unrelated, but clearly defined, Cooley Y's. The CF01 Cooleys are not at all related (through the patrilineage) to the CF02 Cooleys, nor they to the CF10 Cooleys. The Cooley assignment is completely arbitrary. It's a cultural anomaly. Perhaps even a twisted anomaly considering how the patriarchy regularly behaves. Genetic genealogists are pleased that this genomic/cultural coincidence exists. The genetic and the historic often dovetail, making it one reason the Y is such a powerful tool in the genealogist's arsenal. Geneticists tend to see surnames not so much as family names but as "sire names," identities for paternal lineages — those slender threads on our family trees I keep harping about. I was fifty-six years old before I tested my Y chromosome and discovered that my genealogical heritage indeed follows my biological lineage. It's likely I would have experienced a small identity crisis if it had been otherwise. But if the chips had fallen the other way, family would still be family — and I suspect I might have made a re-alignment and changed my name to Gordon. As I described in A Cooley By Any Other Name, what we call ourselves doesn't matter all that much. Surnames are a cultural identity and never a biological reality. Although they often correlate, they aren't fused. It's no matter that Cooley Group CF06 acquired its name via an adoption two hundred years ago. All names were, at varying points in time, a fabrication; and few of us can take our surname back before seven or eight hundred years ago. Even then, the etymologies vary. Cooley, for example, emerged from several sources. I tend to believe that the CF01 version came from Coo, Scottish for cow, plus ley, Middle English for field. It has to be other Cooley families (I'm sure!) that got if from the French word, coulis — the broth of boiled meat! In short, I've long contended that we take surnames far too seriously. They've become almost tribal in nature, which is a serious cultural deficiency. I'm not smart enough to come up with a good replacement for patronyms as family names, or even to decide whether family names remain practical in the modern age. But we have the ability to change the arbitrary designation at any time, just as Archibald Leach did more than three-quarters of a century ago. (It made him no less a Leach, and he certainly became a legendary Grant.) Considering the advent of popular genetics, digitized historical records, and a slow-melting (many of us hope) of the patriarchy, perhaps it's time to snub the patronym business altogether. After all, although my name, family-wise, is Cooley, patrilineally I'm R1a-YP4491. You're welcome to shorten that and call me Mr. 91.